This was Caitlyn's first year to go trick-or-treating. 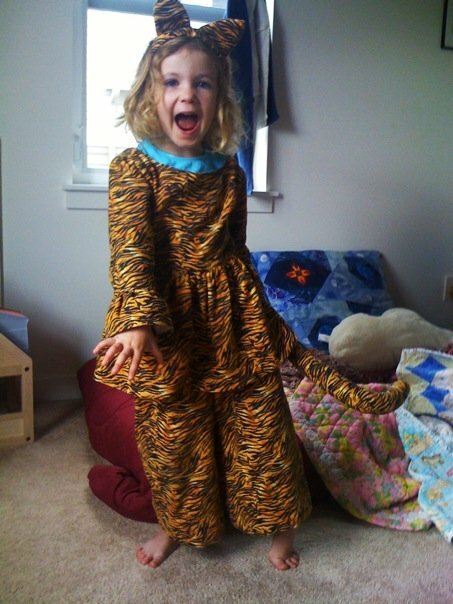 Christina sewed a lovely tiger costume for her (by request), which she's been wearing at every chance, giddy with anticipation. Ever since I was a kid, much has been made of the dangers of Halloween; don't trust candy from your neighbors! Trick-or-treat at the local shopping mall instead! It's almost as if there was a nationwide conspiracy to use fear to erode local community in favor of chain retail stores. Those stories have now been debunked, but their effects linger on. Yet what we found this Halloween was how the night turned the whole neighborhood into a sort of giant block party for kids. Costumed groups wandering the streets and sidewalks, folks watching from their porches and doorways, everyone friendly and cheerful. Surely the candy was a good motivating factor, but Caitlyn obviously enjoyed the pleasure of interacting with her neighbors and showing off her fancy outfit. So here's for Halloween, one of the few holidays where you're encouraged to introduce yourself to your neighbors!